When I was growing up, I knew I wasn't like everyone else. When I wanted to make biscuits and gravy, I didn't want to grab a packet and a can. I wanted to go get the flour, buttermilk, the rolling pin, etc. and create a meal. Not just throw some food on the table. I wasn't satisfied with the fact that I could toss a package in the microwave and call it food. It didn't set well with me. It seemed lacking. I didn't really think of how lacking it was in nutrition until much later on in life, but I did know it was lacking in taste, flavor, time, and effort. As a newly married, young mother, I would tend to fall in the rut of the same few dishes that I felt comfortable with. I wanted better for the family, but honestly, I didn't know what to do about it. Hamburger helper was convenient and cheapish, so those two would win out when I didn't know what else to make. My young daughter was fairly healthy, my husband and I were too. But... I have learned that there is more to health than just seeming healthy. I fed my family, but I wanted to nourish them. Time marched on, we became a family of six and my pursuit of health and nourishment continued. I began adding in aspects of this and that. Pulling away from artificial, or preservative laden foods. I quit buying most of the boxed foods that normally graced my supermarket basket. I started reading. I started reading a LOT actually. 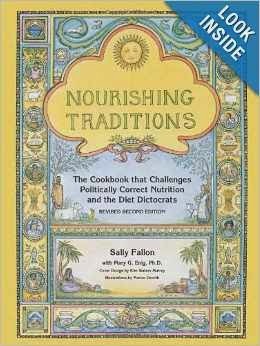 One book that started me to thinking and questioning every thing I had known before about health was Nourishing Traditions. This book started making me realize that all this fake food, artificial, fat-free garbage was just, in fact... garbage! It was not helping us, it was hurting us deeply! If you can get a copy of this book, read it! It is extremely helpful! Check the library, if you don't know anyone who owns it! I began making little changes. I traded in that tub of Country Crock for butter. I began buying whole milk instead of skim. Things that I could do. I built my pantry with more real foods. I began canning more. Then I started learning about the benefits of a good home cooked meal. Did I do it right all at the start? Do I do it all right now? I just made a pan of boxed brownies for my husband, because he asked. No, but I made my hubby happy, and life is about give and take. At the same time I had those boxed brownies in the oven, I had a large crockpot full of organic beef broth bubbling away, and another pound of raw almonds soaking for the dehydrator. Give and take, you see. How does one begin a Whole Foods Kitchen? It can be VERY overwhelming, and very time consuming. For part one, here are FIVE easy steps! 1. Take it slow. Begin with baby steps. Decide what you can do with the time you have, the time you want to spend in your kitchen, and decide what is the most important to you. Maybe it will be just one REAL food meal a day to start with. Focus on Supper or healthy snacks... what will be the BEST way for you to begin? 2. Cut out 2 things that you know are wrecking your health. Cut it out, email me and I will send you some water kefir grains or a kombucha scoby. You will never miss soda again! 3. Begin planning your meals. Survey your pantry, your fridge and freezer. See what you have and what you can use. Start searching the web for whole foods recipes. There are TONS!! Really! 4. Check around, make some friends with like-minded people. You may tap into a WEALTH of information this way! I have surrounded myself with friends who are INVALUABLE to me. Not only do I love them as friends, but, they are my whole foods cheerleaders. We are constantly teaching one another useful skills and healthy tips. 5. If you can find it, join a whole foods co-op! We have a local co-op for organic fresh fruit and veggies, but we also buy from Azure Standard once a month (sometimes) to supplement our foods and keep us out of the grocery store as much as possible! FIVE easy steps to begin you on your journey to health!